Ann Scott Tyson found reporting especially challenging in the western region of Xinjiang, where she went to witness the impact of China’s forced ‘reeducation’ of its Uyghur minority. But that work produced a rare and nuanced look at the project’s effect. 19 Nov 2018 – Winter is coming, and farmers in this Uyghur village are busy cutting branches pruned from walnut trees for firewood. The wood is fuel for small metal stoves that heat their mud-and-brick homes. Other villagers are washing the coarse wool rugs they use to cover their floors and hang on walls as insulation against the cold. Much work remains to be done. There are red dates to harvest, and maize to dry and store. But as chilly winds sweep this dusty village of some 400 households on the edge of the Taklamakan Desert in China’s far western region of Xinjiang, a noticeable shortage of hands is causing many families to struggle. “My older brother is in training prison,” one villager says, watching her toddler play under a grape trellis in the courtyard of her traditional Uyghur home. “My sister is in a training prison, too,” she adds quietly, as sheep bleat in the adjacent manger. members, including her disabled mother, with an income of about 1,500 yuan ($216) a month. The high ratio of detentions uncovered in the village, while only one data point, offers further firsthand confirmation that China’s program of mass incarceration of ethnic Uyghurs in political education camps in Xinjiang has swept up vast numbers of people in recent years. Experts and human rights groups estimate that as many as 1 million of the total Uyghur population of 11 million have been forced to undergo “reeducation” in the most serious assault by Chinese authorities on Muslim minorities since the 1966-76 Cultural Revolution. Xinjiang, and some Uyghurs want greater autonomy or even independence from Beijing. But experts view the root cause of unrest as China’s decades of repression and discriminatory treatment of Uyghurs. The government’s arbitrary confinement of Uyghurs – taking parents away from their children and able-bodied workers away from their families – is tearing at the fabric of rural life in southern Xinjiang, where the Uyghur population is concentrated. Authorities are also waging a highly invasive campaign to monitor and indoctrinate family members who remain at home, conversations with dozens of villagers over several days reveal. In this village on the outskirts of the ancient oasis town of Hotan, the detention of an estimated 200 of the village’s 1,500 people closely matches findings in villages around Kashgar and other parts of southern Xinjiang by human rights groups, which condemn the detentions as illegal under Chinese and international law. Streets here appear desolate, even on the traditional Sunday market day. Many adults seem subdued and wary. The large, engraved wooden doors on several houses are padlocked, and some have been recently sealed with white strips of paper by cadres from the village Communist Party branch – a sign that the inhabitant was accused of wrongdoing. Outside one family-run fabric shop, a gray-haired worker, his hands rough and his coat worn, fumbles with threads to form tassels on a garment. Asked how his trade is faring, the shopkeeper frowns and shakes his head. After darkness falls on the village, the rhythmic clacking of wooden silk looms sounds late into the night. One village weaver, her arms and back tired from the work, has little choice but to toil long hours. “My husband is in the training prison, and I am the only one supporting my family now,” says the weaver, who makes about 1,000 yuan ($145) a month. “I don’t know when he will get out,” she says with a despondent look. China’s government until recently denied the widespread detention of Uyghurs in Xinjiang camps. But with evidence and international pressure mounting – a United Nations panel in August voiced concern that China had turned Xinjiang into a “massive internment camp” – it changed course in October, saying the facilities were part of a program to “get rid of extremism.” Under the program, authorities say, Xinjiang residents “suspected” of minor offenses and “mistakes” in connection with religious extremism are sent to “vocational training institutions” and “boarding schools.” There, they are rehabilitated and “saved,” said Shohrat Zakir, the chairman of Xinjiang’s regional government, in an interview with the official Xinhua News Service. The government’s goal, Mr. Zakir said, is to “eliminate the environment and soil that breeds terrorism and religious extremism,” especially in southern Xinjiang, where he said residents’ lack of Chinese language ability, job skills, and legal knowledge make them “vulnerable to the instigation and coercion of extremism.” Trainees must engage in “deep self-examination of their mistakes” and meet “required standards” to complete their training, he said, indicating the time frame is indefinite. But for Uyghur villagers here who have seared in their minds the dates authorities took away their loved ones – months ago, a year ago, or even longer – such official statements cannot dispel the reality of the “training prison.” Uyghur residents in Hotan say people can be arbitrarily detained or questioned by police for even hints of Islamic faith – such as wearing a beard or covering the face with a scarf, observing Muslim restrictions on smoking and drinking alcohol, or attending a religious service. “Anyone who practices Islam is being detained,” says one Uyghur man. “They are all gone,” he says, holding his arms out straight with his wrists touching as if in handcuffs. Family members of those deemed “untrustworthy” are often detained as well, in a form of collective punishment, human rights advocates say. Inside the camps, detainees are required to learn Chinese, sing patriotic songs and Communist Party paeans, and study anti-extremism and anti-terrorism rules. They have also been subjected to torture, solitary confinement, and other forms of physical and psychological mistreatment, according to interviews by human rights groups with former detainees. The camps are often located in former schools or factories that have been fortified with barbed wire and guard towers, according to researchers who have used satellite imagery and procurement records to track the development and expansion of the incarceration system. While dozens of camps have been identified throughout Xinjiang, they are concentrated in the four southwestern prefectures of Kashgar, Hotan, Kizilsu, and Aksu, where the majority of the Uyghur population lives. Some villagers say they are allowed to visit their detained relatives once a month, while others have not seen them at all, even after more than a year’s absence. Some of the detained villagers are being held as far away as the cities of Aksu or Ürümqi, Xinjiang’s capital, several hours away, while others are nearby in Hotan. International criticism of the camps is rising, and in mid-November 15 Western envoys in Beijing asked to meet Xinjiang Communist Party chief Chen Quanguo for an explanation of the alleged rights abuses. Down the road from the village is one camp identified by online researchers – a tall, sand-colored building surrounded by barbed wire near the banks of the Yurungkash River. Two blocks away is a huge, six-lane police checkpoint where passengers and vehicles from Uyghur villages are searched before crossing a bridge into downtown Hotan. Police wielding anti-personnel spears with dagger-like tips, riot shotguns, and long clubs spiked with four-inch nails man the checkpoint, one of hundreds built as part of a population-control grid imposed on Hotan. They scan government-issued IDs and question and photograph Uyghur travelers inside a station equipped with two large detention cells. One day recently, a middle-aged Uyghur man wearing a four-cornered skullcap, or doppa, stands inside one of the holding cells. His hands grasp the metal bars as he looks out with a plaintive expression. All the travelers at the station are at the mercy of the police, so no one can do anything but make eye contact and nod in his direction. At a village stand piled with local melons, grapes, and other fruits and vegetables, a young Han Chinese woman rides up on a scooter and buys some oranges. She says she arrived about a month ago from Gansu province, and moved into the village kindergarten, where she teaches Uyghur children Chinese. Even as Uyghur families have watched their relatives taken away, they have had to accept a large and intrusive influx of Han Chinese, some born in Xinjiang and others from what is referred to locally as neidi, the overwhelmingly Han “inland,” or China proper. Teams composed mainly of Hans are dispatched by the government to live in Uyghur homes for days, weeks, or longer to monitor and instruct them. “A lot of Han cadres are here living in the farmers’ homes. One cadre may be assigned to three Uyghur families, so he rotates and spends one night in each of the homes,” says a Han resident of Hotan who is familiar with the program. “They are here to change the Uyghurs’ thinking,” he says. The human engineering project is just one example of the intrusive government controls on the daily lives of Uyghurs who are not in detention – controls that strongly parallel the treatment of Uyghurs inside the camps. Under the mandatory Xinjiang program, initiated in 2014 but expanded dramatically in 2017, some 1 million mainly Han officials have been sent into Uyghur households for homestays, focusing on families of Uyghurs who have been detained. During the stays, they monitor Uyghurs for any signs of observing Islam, contacts with foreigners or outsiders, the number of household knives, among other things – and report their findings to authorities. Suspicious activity reported by the Han visitors can lead to more detentions. Meanwhile, they teach the families Chinese language and culture, and spread Communist Party propaganda such as President Xi Jinping’s vision for China. Several Uyghur villagers described having Hans living with them, observing their daily life, requiring them to speak Chinese, and – in some cases – giving them health checkups. It was not clear whether the health checks involved taking blood samples, part of a reported government plan to collect residents’ DNA. Villagers say they are also expected to attend nightly political study sessions at the village Communist Party branch office, which they call the dadui, an old term from the Maoist era meaning commune production brigade. There, they say, they study more Chinese and sometimes sing patriotic songs. Underlying the program is the idea, voiced by several Hans encountered in the village and in Hotan, that Uyghurs are “backward,” “ignorant,” and lack ambition, and so are susceptible to religious extremism. Chinese civilization will cure this, they suggest. “Uyghurs just live for the day,” says one Han in Hotan. On a dusty backstreet of the village, an aspiring Communist Party member from Ürümqi speaks energetically about the success that the civilian teams are having transforming the mind-sets of the Uyghur villagers. “This is a very backward area, and the religious beliefs here are very strong. That is why this area was chaotic,” says the young man, currently a member of the Communist Youth League – a pathway to party membership – who attends university in Ürümqi. He says he is living in Uyghur homes and teaching villagers Chinese, while also focusing on their beliefs. “People here are ignorant, so they believe in religion. We are having a good impact on changing their beliefs,” he says. Although Uyghur himself, he speaks flawless Mandarin. He stresses that he’s spent the entirety of his young life in Chinese-language schools, and doesn’t believe in God. Soon, he says, he will apply for Communist Party membership. The village party branch has organized a team of five people, led by the local party chief, with the mission of curtailing religious influence in the village, he says. While the government has long imposed religious restrictions on Uyghurs and other Muslim populations in Xinjiang, today’s controls – including the threat of detention – have all but outlawed the practice of Islam in the region. North of the village, at the end of a dirt road, a path lined with poplar trees leads to a shrine, the mazar of Imam Asim, a Sufi holy man said to have led the Islamic conquest of Hotan in about 1000 AD. Until two years ago, it was a destination for thousands of Muslim pilgrims. Now the site is barred and stripped of religious symbols. A nearby street with shops that once sold food, tea kettles, and other goods is abandoned. The village mosque has been torn down, as have many in Hotan, residents say. Parents are prohibited from allowing children to participate in any religious activities. “No one dares to practice Islam openly,” says one resident. Yet despite the pressure, some Uyghurs still pray in private and fast during Ramadan, residents say. 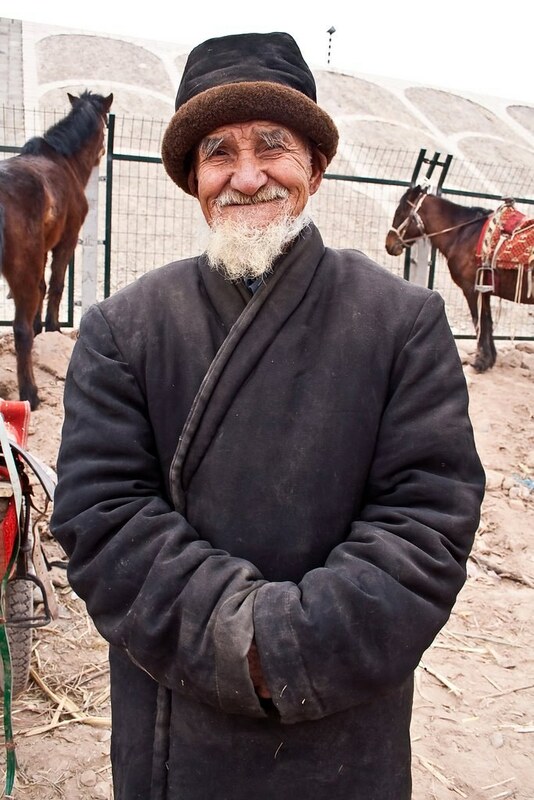 And whenever elderly Uyghurs hear the universal Muslim greeting As-salaamu alaykum (peace be upon you), their faces light up and they respond without hesitation: Wa alaykumu as-salaam (and peace be upon you). In a red date orchard on the outskirts of the village, an elderly Uyghur farmer hoists a brittle pile of pruned branches and leaves over his head and tosses it onto a smoldering fire, sending flames leaping skyward. The annual pruning work is time consuming but needed to ensure maximum production of the dates, or jujube, a major crop in this region. The reddish-brown fruit still hangs on the branches, growing sweeter as it wrinkles in the desert air. Soon the farmer will pick them, but the crop does not belong to him. The several hundred date trees – a large orchard by village standards – are owned by a Han Chinese migrant from the inland province of Henan who moved here 10 years ago and leased the land from the government. He hires Uyghur villagers as laborers – a common practice in the area, where Han farmers manage lucrative fruit and nut orchards. Uyghurs tend to practice subsistence farming of wheat and maize while also raising sheep, cows, chickens, and pigeons. The underlying inequality between Hans and Uyghurs in Xinjiang has caused tension as Uyghurs have felt marginalized, experts say. China’s government has for decades worked to assimilate and control Xinjiang by both mandating and encouraging Han Chinese migration to the frontier region, in part by offering jobs, land, and other incentives to new arrivals. The Han population of Xinjiang grew from 7 percent in 1949, the year of China’s communist takeover, to 37 percent in 2015, while the Uyghur population has declined from 75 percent to 48 percent over the same time period. Hans tend to dominate higher-income manufacturing jobs in the urban areas, particularly in the north, as well as the oil and gas industries, while Uyghurs mainly hold lower-paid agricultural jobs and live in the countryside. As part of the Han migration, starting in 1954 demobilized Chinese troops set up vast production corps known as bingtuan, carving out large tracts of Xinjiang territory to build farms and factories. The semiautonomous bingtuan have their own police and militia and are often strategically positioned between and around Uyghur settlements. They continue to expand, now comprising some 2.7 million residents, about 90 percent of them Han Chinese. Today, a large bingtuan built in 2004 in the desert 40 miles from Hotan boasts some of the biggest orchards for red dates and other fruits in the region, and employs Uyghur seasonal laborers to harvest them. A group of Uyghur women sit in the sun, sorting a mound of dates from large to small as their children sleep nearby in portable wooden cribs. “I earn 80 yuan ($11.50) a day,” says one woman, who has harvested dates for six years. Uyghur farmers from Hotan are being forced to work harvesting cotton and other crops, residents say. Such practices have fueled some resentment among Uyghurs, who feel unfairly treated by the government and disadvantaged by the Han Chinese arrivals. Back at the red date orchard, as the Han farmer oversees the pruning, two older Uyghur men approach him with a request. Can they allow their sheep to graze in the orchard and eat the date leaves after the harvest? “For 2,000 yuan ($288),” the Han says. The Uyghurs seem taken aback – that is more than they earn in one month. One Uyghur wearing a black wool cap offers 500 yuan ($72) and tries to put the bills in the farmer’s hand. But the farmer refuses and backs away. They haggle some more, but the Han won’t budge. Finally, the Uyghurs trudge off. “You are crazy!” one shouts over his shoulder. Life in the village goes on, with all its complex undercurrents. On an outdoor table covered with a red cloth, a village woman, her hair tied back in a scarf, shapes bread dough over a large stone and presses it onto the wall of a hot brick oven. One after another, she forms and bakes the flatbread, or nang, a staple of the Uyghurs, using a metal poker to retrieve them from the blistering oven. She is noticeably sullen. Asked about their family, her school-aged daughter, who is playing nearby with friends, replies. “My father is in training prison,” she says, reciting the exact date he was taken away last year. “My father is in training prison, too,” her friend chimes in, also naming the date. A third girl announces that both her parents are still at home – as if bragging about something special. The mother, formerly a seamstress, started the bakery a month ago to try to make up for her husband’s lost income. Her daughter wonders when she will see her father again. “It’s already been more than a year and a half,” she says. For Uyghurs, the splitting apart of families is one of the most painful aspects of the government repression in Xinjiang. Not only are children deprived of parents, they are receiving indoctrination suggesting their father or mother – or both – did something wrong, undermining them as a trusted role model. In some cases, family members have been forced or felt compelled by authorities to denounce one another, according to human rights reports. This night, she makes a wish for her father. Ann Scott Tyson is an American war correspondent, reporting from combat zones since the invasion of Iraq. She has written for the Christian Science Monitor and the Washington Post and contributed to the Wall Street Journal. Tyson is a graduate of Harvard University with an honors degree in government and has studied economics and business at Columbia University. think every one is getting more from this web site, and your views are pleasant for new people.